The pattern of atherosclerotic occlusion commonly found with diabetes involves the tibial and peroneal arteries but spares both the superficial femoral artery as well as the arteries of the foot, especially the dorsalis pedis artery (1). In general, patients without diabetes tend to have more proximal disease affecting the femoral arteries, often at the adductor hiatus. 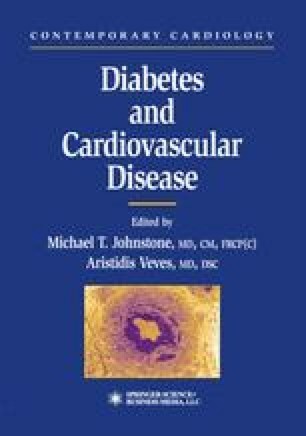 The propensity toward tibial/peroneal involvement (crural disease) in diabetes mellitus was noted in prospective studies of amputation specimens (2) and more recently by arteriography (3). One of the early impediments to extreme distal reconstruction in diabetes probably resulted from the initial suggestions that there was an occlusive lesion in the microcirculation that would prevent tissue perfusion (4). All the subsequent prospective studies have failed to confirm the existence of such a lesion. Noninvasive vascular evaluation of diabetic and nondiabetic patients presenting with foot ulceration confirmed that there was no evidence of higher vascular resistance (5). With this understanding of vascular disease in mind, therefore, it is logical to extend arterial reconstruction to the arteries below the knee, especially the dorsalis pedis artery in patients with diabetes. In general, after vascular reconstruction, the foot is more resistent to recurrent ulceration, and can withstand and recover from infections better.